I once had a lousy girlfriend.Â That happens to everyone â€“ it’s a part of your life like when you first learn to ride a bike and you keep falling off and it’s just terrible.Â This girlfriend left me with really nothing positive except that she reintroduced me to the writings of F. Scott Fitzgerald.Â I had ready The Great Gatsby and wasn’t too enthralled with it, but then, at her prompting, I read The Beautiful And The Damned.Â It was incredible and one of the best things of Fitzgerald’s I’ve ever read.Â When I heard that this movie was based off of a short story by Fitzgerald, I knew it would be fantastic.Â Now you have the chance to see just right that assumption of mine ended up being. Starting this May 5th, now available in a two disc special edition from Criterion and Paramount Studios Home Entertainment comes a wholly unique and compelling look at life and love and just how intertwined the two are.Â The Curious Case Of Benjamin Button â€“ The Criterion Collection is ready to crawl out of your television screen and liven up your living room with its fascinating look at the connections between people over time and what happens as we all grow older.Â Bring home this beautiful and mesmerizing film today! Benjamin Button was born as an eighty year old baby and as he grew larger, he grew younger in time.Â He first met the red-headed girl he was to fall in love with when she was a young child.Â He sailed the seas on a tugboat, fought in the second world war and barely survived, made a fortune, gave away a fortune, fell in love, had a child, watched love fall away from him and eventually grew all the way into a child as those he loved turned old around him and died.Â This movie stars Brad Pitt, Cate Blanchett, Taraji P. Henson, Julia Ormond, Jason Fleming, Elias Koteas and Tilda Swinton and was directed by David Fincher. 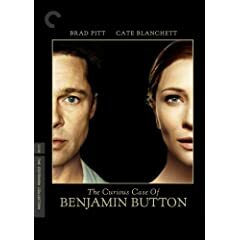 What sets the Criterion Collection films apart is all of the special features.Â This movie is not exception.Â The two disc set contains interviews with Brad Pitt and Cate Blanchett, optional audio commentary from director David Fincher, a look at the process which aged Brad Pitt for the film, a look at David Fincher’s creative process on set, still galleries from the film and so very much more. I was very surprised to see that this movie was coming out as a Criterion Collection film already.Â Usually they wait several years to do that, but with this film, it makes sense.Â This is an instant classic, because it does have that feeling of timeless presence to it.Â I was prepared to dislike this film.Â I think that Brad Pitt can sometimes be drawn to pretentious movies and waste his charm inside of them.Â The previews made the movie look like something more exciting than it was, a long, sad story about love and life.Â But once you let go and accept that this is what the movie is all about, it was fantastic.Â The clock running backwards, some of the hilarious lines in the movie that sneak up on you because you aren’t expecting any humor, seeing Brad Pitt back on the top of his game.Â The bit where the guy talks about the seven times he was stuck by lightening was one of the funniest things I’ve seen in a movie this year.Â This is a glorious story about growing old and young and having life pass you by.Â I was deeply moved and I guarantee you will be as well. Get Curious and then pick up this must-have film! This two disc set is available at Amazon.com. 1 user commented in " Movie Review: The Curious Case Of Benjamin Button â€“ The Criterion Collection "
I saw the movie and loved it!